Oasis Mini Hollywood Theme Park is located in the region of Almeria, Spain, more precisely in the Tabernas Desert, which is known as the only desert in Europe. 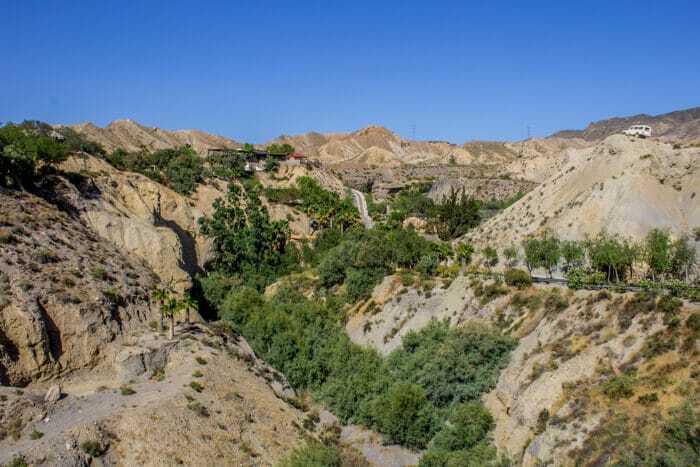 Due to the characteristics of the landscape, the Tabernas Desert was used as a filming location in world famous movies such as “Cleópatra“, “Lawrence of Arabia” and in the Sergio Leone’s Spaghetti Western films. In its golden age, in the 60s and 70s, actors such as Clint Eastwood, Brigitte Bardot, Anthony Quinn, Claudia Cardinale and Orson Welles could be seen in this desert. 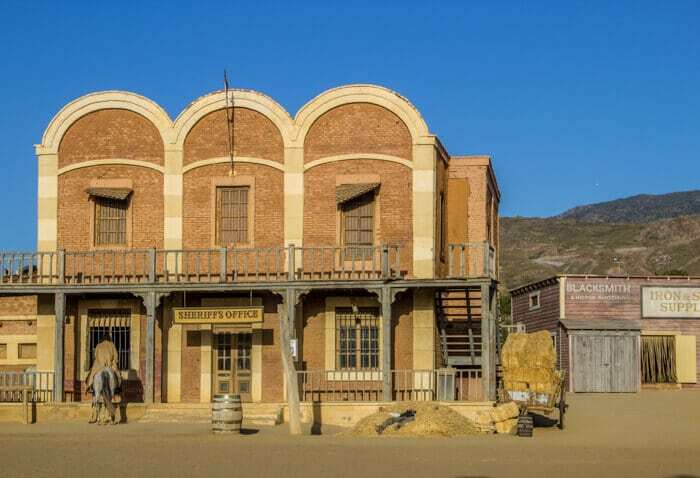 That´s why Tabernas Desert is also known as the Hollywood of Spain. Oasys Mini-Hollywood is not the only western theme park in Tabernas Desert. However, it´s the largest and the one that offers a wider offer. 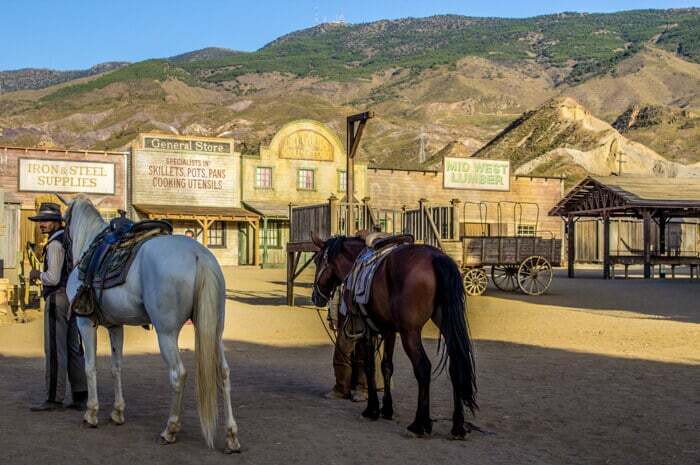 The other parks are: Fort Bravo – Texas Hollywood and Western Leone. If you are looking for a simple and well-located accommodation to explore all these parks, while having a different experience, Fort Bravo might be the solution. Apart from being a theme park, it also has bungalows where it is possible to stay overnight. If you are interested, you can learn more about this accommodation and make a reservation by clicking here. 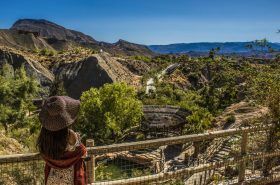 For those who would like to explore Almeria and the Tabernas Desert in more depth, we recommend to download this cinematographic guide of the region of Almeria. 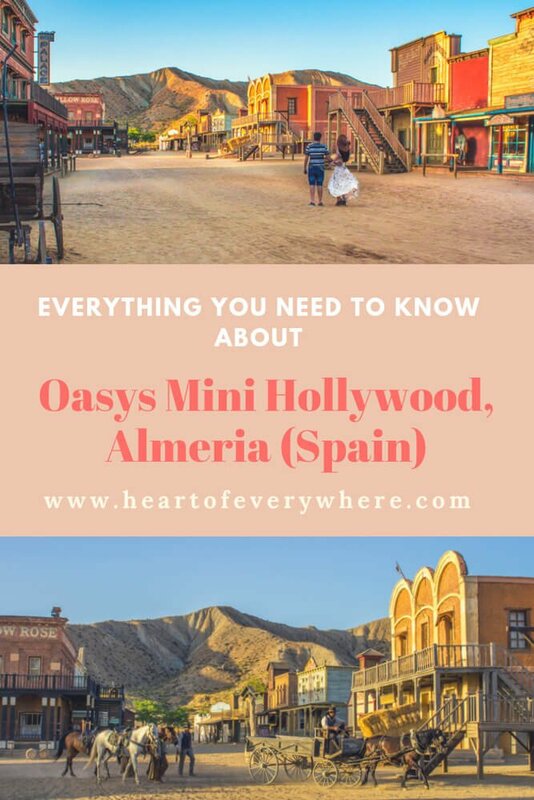 Now that we have made a brief introduction of the cinematographic history of the Tabernas Desert and Almeria region, join us on a guided tour through Oasys Mini Hollywood. Here, we will show you everything you might want to know about this theme park. This is the area of the park where the famous “Spaghetti Westerns” of Sergio Leone were shot. Why are these films called Spaghetti Western? Well, the director, Sergio Leone, is Italian. Spaghetti Western was the word used to distinguish between the American Western films and the ones by Italian directors. Clint Eastwood revealed in an interview that he had complete freedom to play his leading role. For he and Sergio Leone did not speak the same language. Literally! Sergio Leone spoke only Italian and Clint Eastwood spoke English. If you are a movie enthusiast, don´t miss this interview with Clint Eastwood about Sergio Leone. Click here for part 1 and here for part 2. 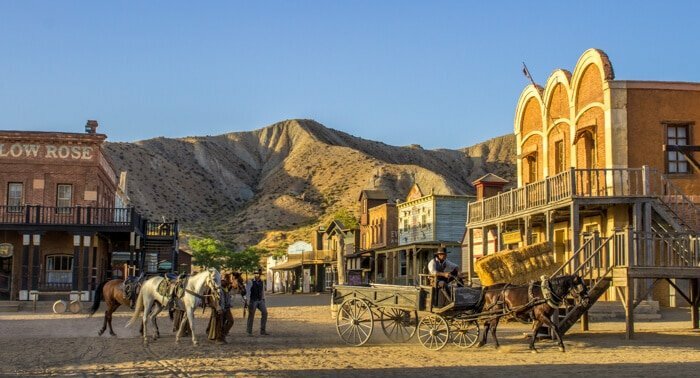 What does the Tabernas Desert have to justify the fact that so many western movies were shot here?This region´s landscape has an astounding similarity with certain areas of Arizona and California. This area of the theme park was the one that surprised us most. We loved the Western Town as it was everything we expected to find. This zoo surprised us precisely because it was something we were not expecting to find. The zoo was far larger than we had expected and had stunning scenic views of the surrounding landscape. 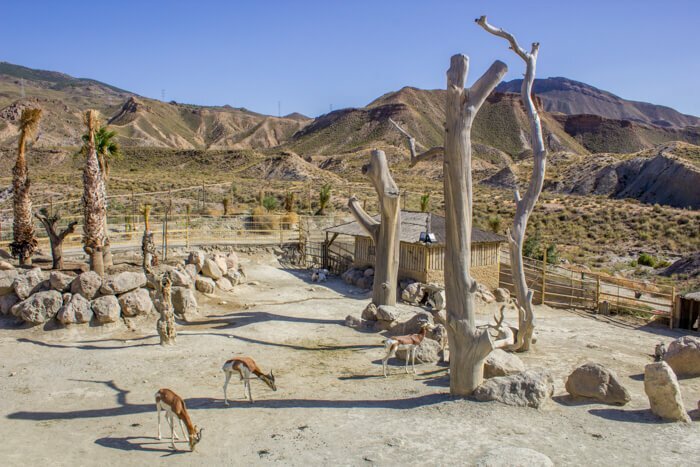 The zoo was inaugurated in 1997 and it´s home to more than 800 animals of 200 different species. 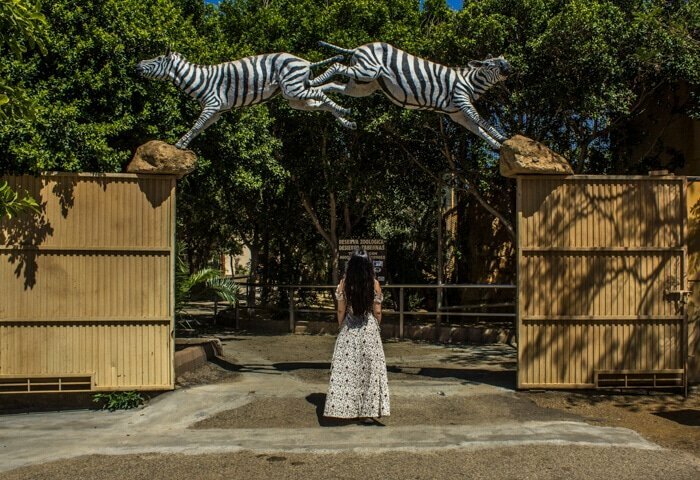 This zoo is not just a space where the animals are on display for the satisfaction of the humans who come to admire them. 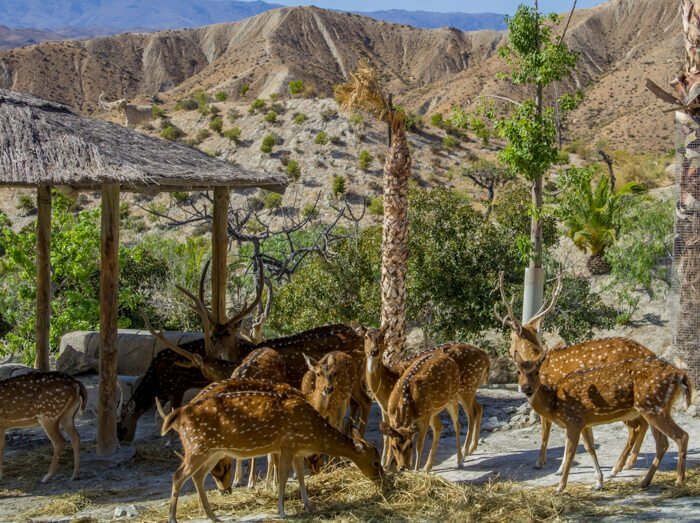 It functions as a zoological reserve, a space for recovery, environmental education, research and has an active role in the conservation of endangered animals. 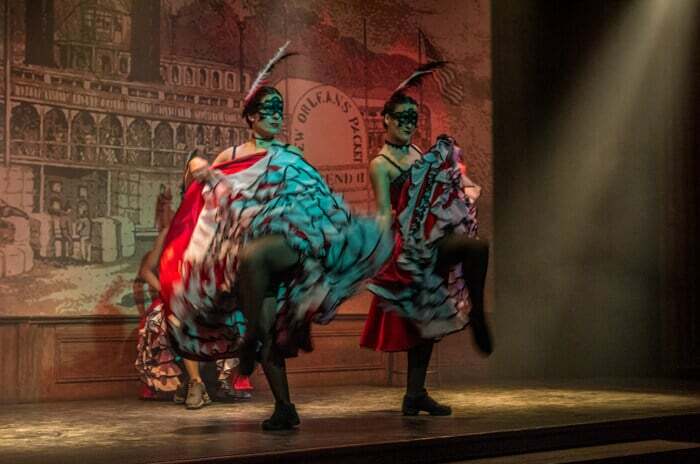 Don´t miss the cancan show that takes place at the The Yellow Rose Saloon in the Western Town. It was GREAT! At 1:00 p.m. and 4:00 p.m. If you are wondering how much each Cruzcampo beer costed, the answer is € 2.60. 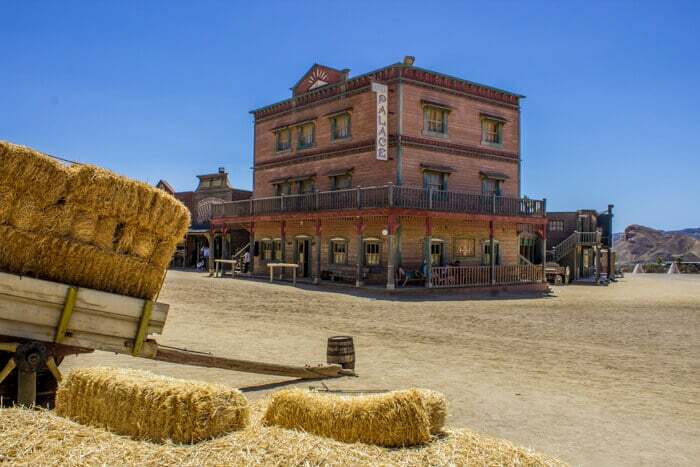 Being this a theme park that has the Old West as the main theme, of course, one cannot miss the western show, a performance that is very characteristic of this genre of films. At 12 a.m. and 5 p.m.
As it might get a little too hot around here, a dip in the pool can also be a good idea. 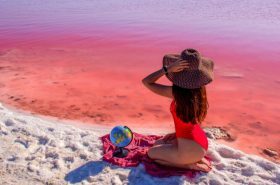 So, don´t forget to bring your bathing suit. We were so entertained by the zoo and the shows that we ended not having time to cool off at the pool. What as our least favourite thing about Oasys Mini Hollywood? 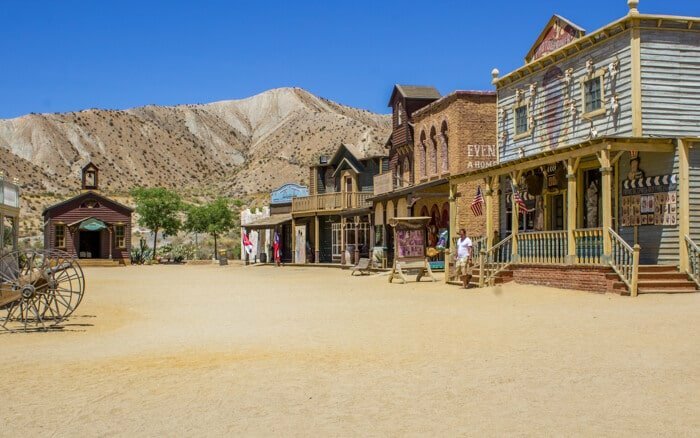 Overall, we enjoyed visiting Oasys Mini Hollywood, but we expected more from the Cinema Museum that is located inside the Western Town. 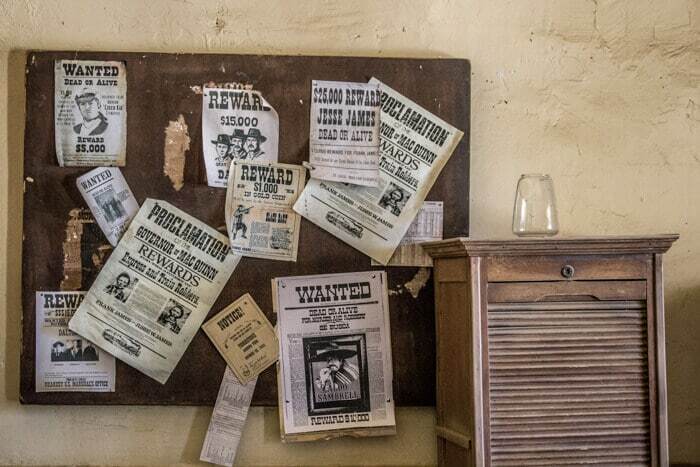 We hoped it to have more trivia, photos and details about the films filmed here or filmed in the area, instead of being just a collection of movie posters and equipments used in cinema. 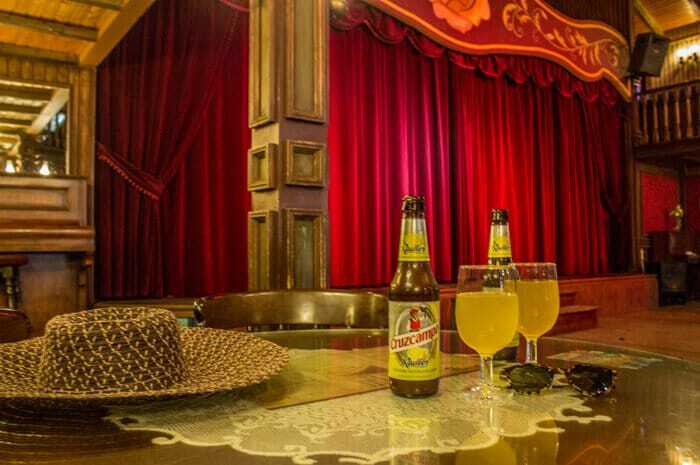 We chose to visit Oasys Mini Hollywood, on a Tuesday and when we got to the ticket office, we were informed that it was barbecue night. The normal ticket costs € 22.50 and the ticket with barbecue dinner included costs € 29.90. We thought it was a good idea to choose the barbecue dinner option. And we don´t regret anything about this choice! 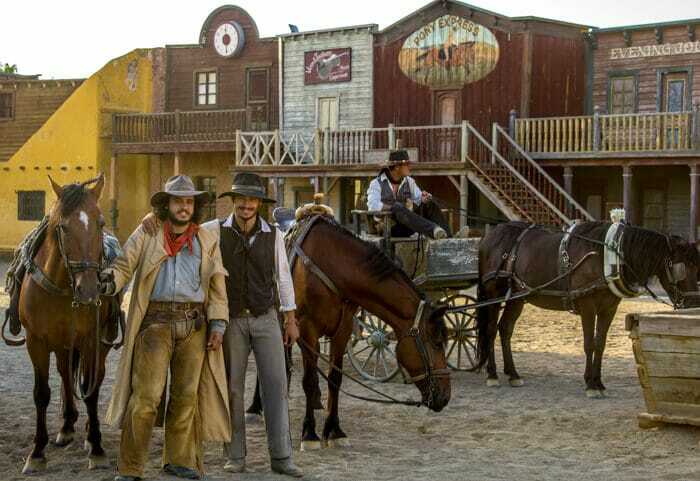 We dined side by side with the actors that performed the western shows and the other visitors. Dinner included sausages, steaks, boiled potatoes and salad. The drink was all inclusive and, in the end, we had ice cream for dessert and a little glass of champagne. Not bad! There was also a performance by the dancers who perform the cancan show but now as cowgirls. Throughout the dinner there was also country music to accompany. This theme park is open every day from Easter till September. During October, it works every day except on Monday. And in the remaining months, it only works during the weekend. The timetable changes according to the month of the year, but usually the park opens at 10am and the closing time can vary between 6pm and midnight. You should always confirm the timetable on the official website. 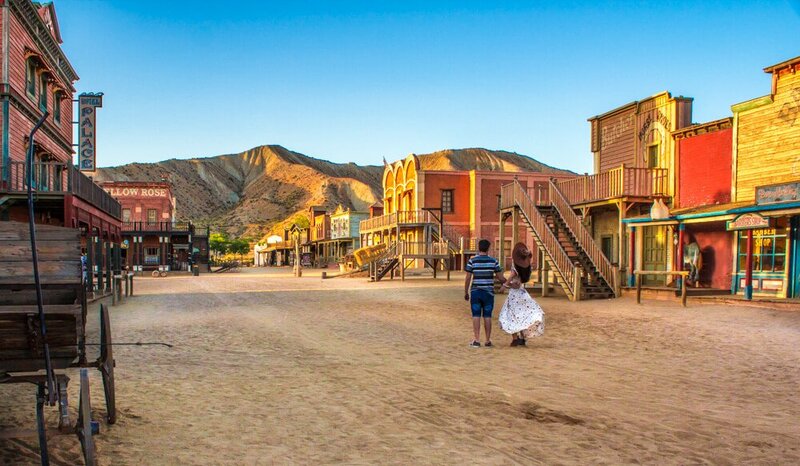 How much time do you need to visit Mini Hollywood? We think that an afternoon is enough. 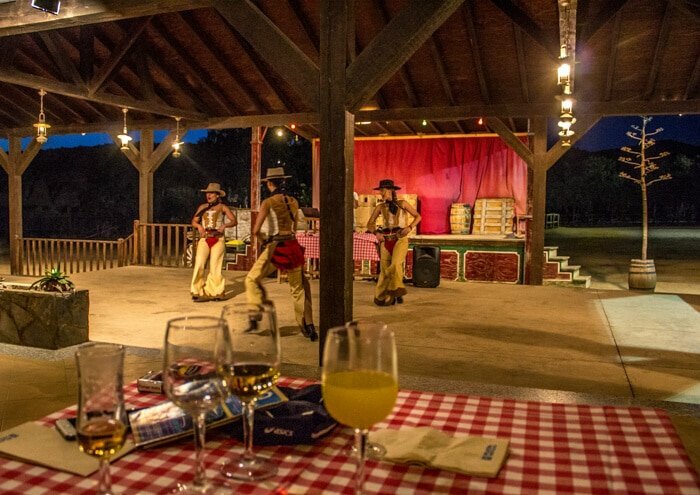 But if you have the opportunity to participate in a barbecue night, we highly recommend as it´s such an enjoyable experience. We arrived around 2:30 p.m. and we left at 11:00 p.m.
For more information check the official website of Oasys Mini Hollywood. 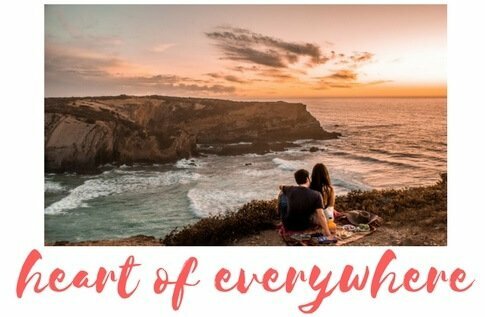 If you´re a frequent reader of our blog, you probably already know how much we love discovering hotels and accommodations that stand out from everything else. 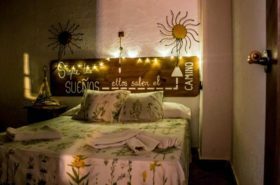 However, during our road trip through Spain we prioritized hotels whit 24 hour check in and minimal conditions of comfort to stay overnight. But there was a hotel that stood out for its fantastic value for money. 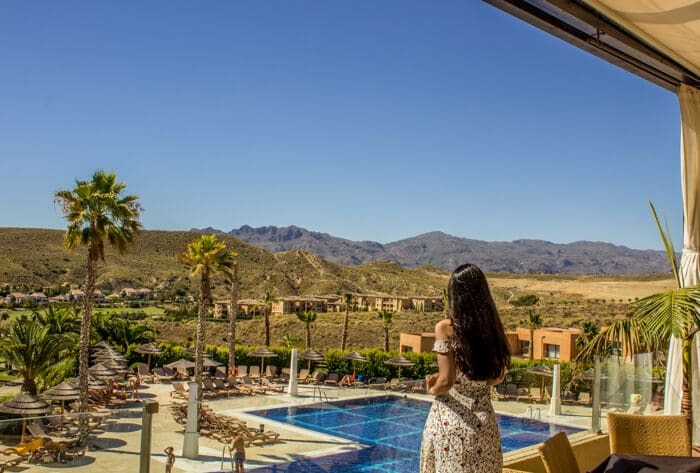 The hotel that we want to highlight here is the Valle Del Este Golf Resort, which was the hotel we chose to stay overnight when we visited Oasys Mini Hollywood. 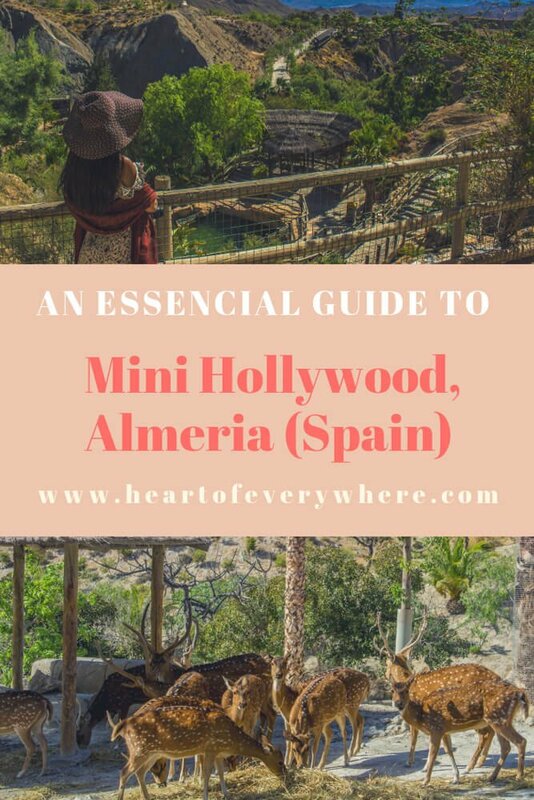 The hotel is located in Vera in the region of Almeria and is about 54 km, a 50 minutes drive, from Oasys Mini Hollywood. As always, we booked trough Booking and we paid € 67.50 for one night in a double room with panoramic views to the pool and the surrounding landscape. Breakfast is included in the price and is fantastic, lots of variety! 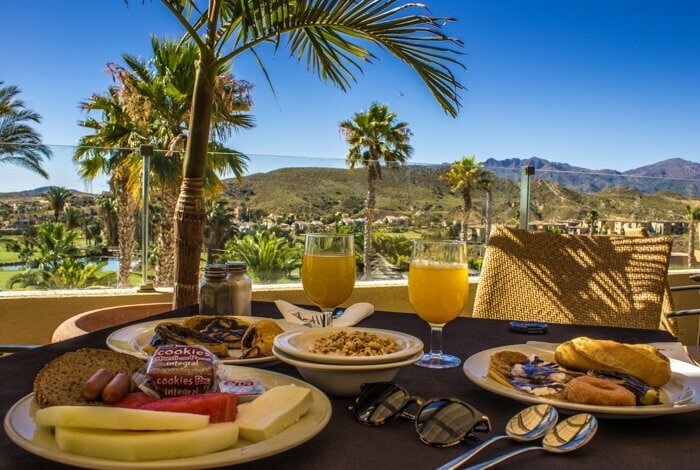 From freshly made pancakes and omelets to churros with chocolate, fruit, sausages and bacon. This breakfast has a little bit of everything, for all tastes. The hotel also has a swimming pool, golf course, spa and gym. Unfortunately, our stay was short, we arrived at night and left in the morning after the delicious breakfast. We ended not having the opportunity to enjoy half of the amenities of this hotel. But, hopefully, will return one day. 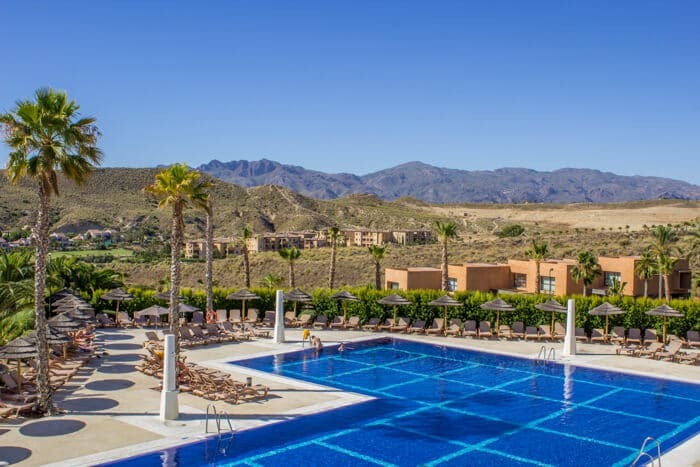 To check the availability of Valle Del Este Golf Resort, see more photos or make a reservation click here. 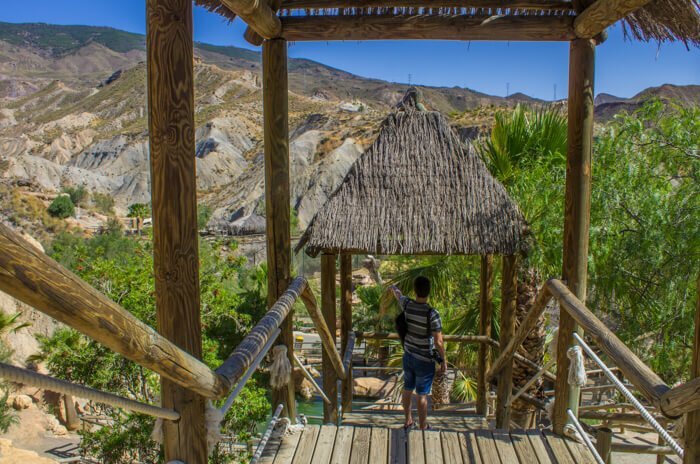 What other theme parks would you recommend us to visit in Spain? 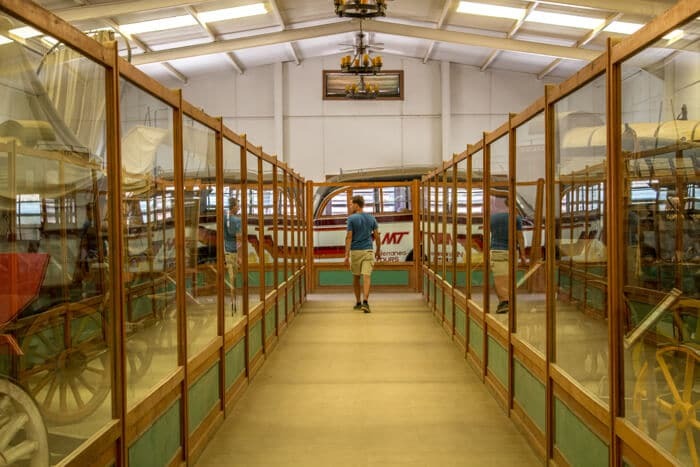 Have you had the opportunity to visit the Oasys Mini Hollywood?